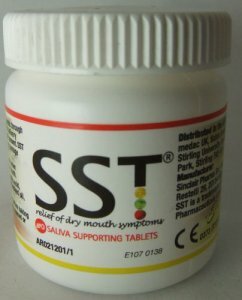 SST is used for the stimulation of saliva production when secretion is impaired and potentially functioning gland tissue is still present. The tablet works through the taste buds to stimulate the salivary glands. SST is formulated to support the natural protection of teeth given by saliva so that no damage occurs to the teeth with repeated used of the tablets. Let one tablet dissolve slowly in the mouth when needed. To obtain optimal effect move the tablet around in the mouth. In case of known intolerance to some sugars ask your doctor before taking this product. Do not used if the pot is opened or damaged. Keep out of the reach of children. Ingredients: Sorbitol (0,3 g per tablet), polyethylene glycol, malic acid, sodium citrate, calcium phosphate dibasic, hydrogenated cottonseed oil, citric acid, magnesium stearate, silicon dioxide.